As the days pass swift like an arrow, the increased technology and population result in the increased use of different materials and products. People try to prove themselves cool and in that process, they neglect the nature. This is nothing new, given that we take the resources she provided for being granted. And this neglect is one of the major causes of soil pollution. People are neglecting the earth and its atmosphere, and their reckless living is impacting their surroundings. Due to all these things, the pollution on earth is increasing at a tremendous rate resulting in global warming. 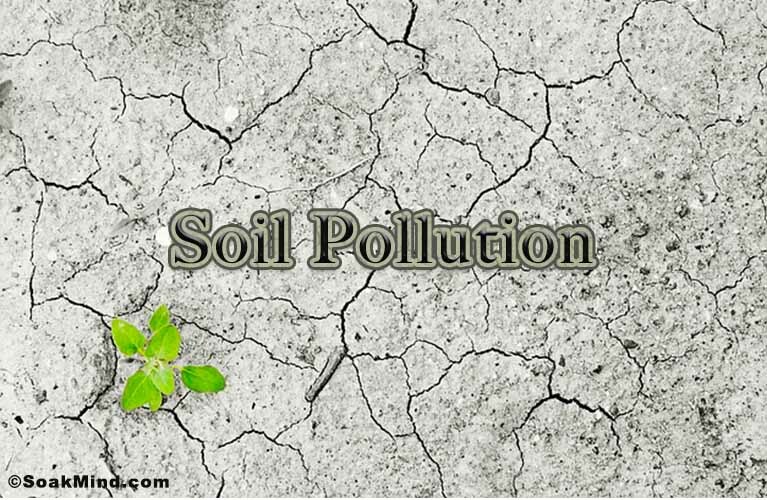 Soil Pollution is in fact known as one of the major pollution types occurring on the earth currently. And the soil pollution effects have damaged various lives and economy. To stop this or at least reduce it, one must understand what pollution is. Addition of any unwanted substance which is harmful to health in our surrounding is pollution. It is important that we take this seriously even though the effects of it are slow. But do remember, that the long-term effects of pollution are disastrous. Pollution is of various types depending on their medium, such as water pollution, soil pollution, air pollution etc. but here we will discuss soil pollution only. We will be discussing the soil pollution introduction, effects, control, and causes of soil pollution. It can be defined as the addition of any harmful substance which is also known as pollutant or contaminants into the soil and polluting it. The presence of chemicals and harmful pollutants in soil, higher than the natural level, is also termed as soil pollution. This is because these additions in higher concentration are harmful to the ecosystem. Every soil type contains different elements and components, and some natural contaminants as well. Some of them are metals, inorganic ions, salts, compounds formed by soil microbial activity, and decomposition of organisms. And some mix in soil through atmosphere and wind activity. When these contaminants exceed the natural level, it starts polluting. There are mainly 2 causes of pollution. This is possible due to an imbalance between atmospheric decomposition and the complex soil environment. The complex soil involves the presence of other chemicals and natural conditions which may interact with the released pollutants. Man-made contaminants are the main causes of soil pollution and consist of a large variety of contaminants or chemicals, both organic and inorganic. 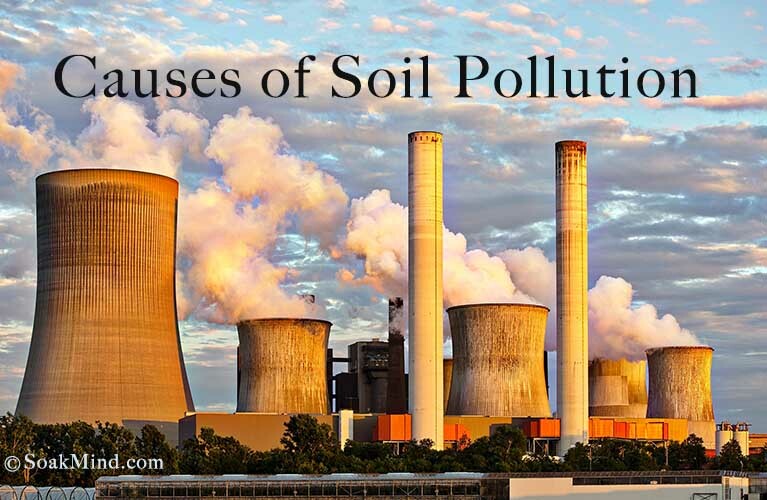 They can pollute the soil either alone or combined with several natural soil contaminants. 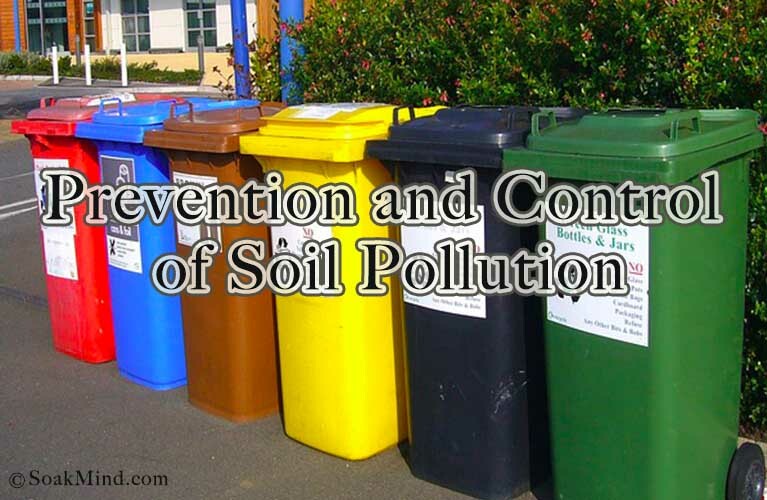 There are various causes of soil pollution, some of them are – Accidental spills and leaks during storage, transport or use of chemicals, mining activities, agricultural activities, waste disposal methods etc. Different human activities like use of pesticides, chemical fertilizers, disposal of urban waste, industrial waste, use of toxic substances, radioactive emissions etc. are also some of the man-made causes of soil pollution. The most common pollutants are biological agents and the chemicals used by humans. Below, the man-made causes are explained in detail. Urban waste and industrial waste contain residues of harmful toxic inorganic and organic chemicals. In these residues, radiation elements such as strontium, cadmium, uranium, and ladders are found, which affect the vitality and fertility of the land. Most of these wastes are non-degradable and they lay on the surface of the soil. In addition, they may get stuck under several layers, polluting the land and some waste creates harmful fumes. The waste coming from cities are disposed and dumped in dumping yards. This not only pollutes the soil of that land but also its surrounding land, disturbing ecosystem and making it difficult for plants, animals, and humans to live in that area. Plants don’t grow easily, they die. And animals and humans catch different diseases. This is one of the major causes of soil pollution. The chemicals used to kill pests (pesticides), increase fertility of soil (fertilizers), control insects (insecticides), etc. are polluting soil to a great extent. Farmers and gardeners use them to increase the crop production. But, their excessive use is poisoning the soil. These chemicals create a lot of waste which goes into the soil and after a certain point, the soil dies. Naturally, the soil regenerates its fertility and nutrients after a certain period of time. But due to these chemicals, the soil is losing its capacity to regenerate. These chemicals not only pollute soil but also pollute water as they get mixed with the ground water. One of the most dangerous causes of soil pollution is the use of bioactive chemicals. Due to this, the micro-organisms of climate and other soil are being destroyed resulting in decreased quality of the soil. Toxic chemicals enter the diet chain, and they reach the top consumer. Bioactive chemicals are also called Creeping Deaths. These chemicals are widely used in every field of medical. So, the waste coming from hospitals contains the maximum amount of bioactive pollutants. Most of the radioactive waste generate from nuclear power plants. And when it is disposed, it kills all the nutrients of the soil and soil becomes permanently dead and poisonous. It is very toxic and can harm anything which comes near it or in contact. The waste coming from cancer hospitals is also radioactive. Substances such as Radium, Thorium, Uranium, Nitrogen, etc. are radioactive and can infiltrate the soil and create toxic effects. The pollution of soil changes the complete ecosystem be it microorganisms, plants, animals or humans. 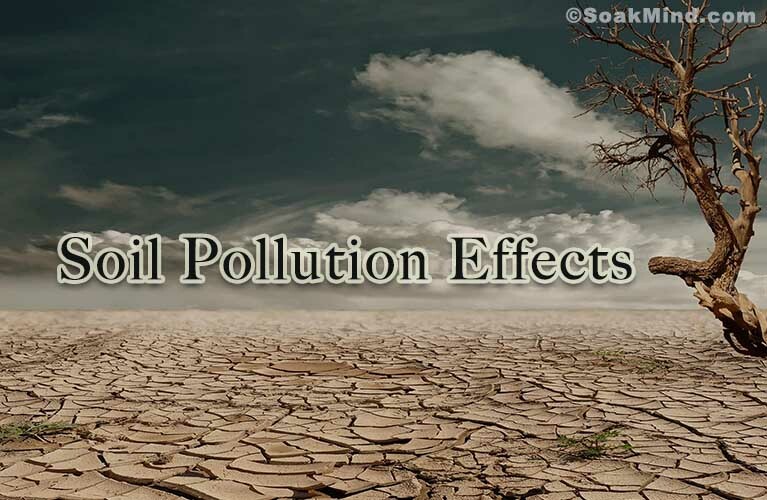 Soil pollution effects may vary based on age, general health status and other factors, such as the type of pollutant or contaminant inhaled or ingested. Kids are more prone to get affected due to this than the adults. This is because they play in grounds and come in contact with the soil more. The soil pollution effects are also for humans due to the inhalation of gases emitted from soil moving upward. Or through the inhalation of matter that is distributed and transported by the wind because of the various human activities on the ground. Soil pollution may cause a variety of health problems, starting with headaches, nausea, fatigue, skin rash, and eye irritation. And potentially resulting in more serious conditions like neuromuscular blockage, kidney and liver damage and various forms of cancer. There are various soil pollution effects on plants as well. Plants need specific atmospheric conditions; proper nutrients according to plant type are required. As we all know plants and trees are the reason why we all are alive. They provide us with oxygen to breathe. And the soil pollution effects are adverse on plants and trees – they are developing different diseases. Plants are not able to cope up and are dying. These pollutants are consumed by plants, making them nutritionless. And at the extreme level of consumption, they are becoming poisonous i.e. injurious to health. Apart from this, even the salt content in the soil increases thanks to the soil pollution. Although salt is present even naturally in soil. But the accumulation of nitrates and phosphates in the soil leads to it increasing the levels of salt present in the soil. This high concentration makes it difficult for the plants to correctly absorb the nutrients present in the soil. And this also reduces the quality of the groundwater present below the soil. Also, it has been noted that the plants which are grown in this region are highly poisonous. And when they are consumed, they can cause severe health issues. The acid rain is also one of the major soil pollution effects. That is, the pollution in the soil allows for the emission of nitrogen into the atmosphere and the decomposition of organic matter present in the soil. As a result of this, sulphur compunds and its dioxides are released into the air which in turn causes acid rain. In the long run, the cycle of acid creation continues which results in further reduction of soil fertility and creates soil erosion. This leads to the death of plants growing in the soil due to the increased pH levels. Soil Pollution results in degradation of crops grown. As a result, the produce on a polluted soil is much less or is of inferior quality. This in turn can affect the sales of crops. And thus declining the income to an average farmer whose livelihood is entirely dependent on the crops. To curb the pollution, the use of fertilizers and other artificial chemicals may be used. But it is costly for an average farmer to afford. As a result, soil pollution has been directly or indirectly responsible for many farmer deaths in the country. In some countries, due to the soil pollution, the soil contains heavy amounts of lead. And the crops often produced on such soils are discarded due to the immense levels of toxicity. According to the report by the Agriculture ministry of China, more than 12 million tons of grains that are polluted are disposed off every year. The economic losses of farmers in china thus amount to close to 2.5 billion dollars. We can control daily waste coming out of our house. Or the plastic waste generated daily by the high consumption of junk food and other inorganic products. The organic waste from houses and hospitality industry can be used to prepare humus. Through the use of proper waste disposal methods, control of soil pollution can be taken care of and can be reduced. The garbage from the factories should be sent to the purifying plants first and they should be immersed only after proper treatment. Reduce the use of plastics and other harmful matters. Recycle the used materials. And reuse the things which can be utilized in one way or another after use. This method will help in abundance for the control of soil pollution. Soil acts as a natural sink for contaminants. If the soil is contaminated, home-grown vegetables and fruits may become polluted too. This happens because most of the soil pollutants present in the soil are extracted by the plants along with water every time they feed. Thus, it is necessary to reduce the use of chemical pesticides, insecticides, fertilizers etc. in the excess amount. And contribute your efforts in the control of soil pollution. As a whole, soil pollution has been a major cause of concern for many nations now. Year after years, steps are being taken to maintain the quality of the soil, and to reduce pollution. Apart from the measures discussed above, it is also essential for the public to have awareness of the harm they are knowingly or unknowingly causing. Strict penalties must be imposed on law violators. And education against pollution and its effects must be started from a very young age with students.